It was time for an overnighter again. I intended to go on a hiking overnighter in Vaskijärvi last Sunday, but couldn't get away until it was too late in the evening. This week's Friday I was better prepared and went on an overnighter with my bike. I even got company. I started from home at 17:15 and rode some local trails and took some pictures before meeting with HAK at 18:00. My Salsa Fargo is again my main bike, now that the winter is over. Packing the bike is easy now when it is warm outside. Coltsfoot (Tussilago farfara), one of the earliest spring flowers. Goat willow, or possibly another Salix species. In some places the birches are getting leaves. After meeting with HAK we rode smaller roads to the Vajosuo area. About 30 km in 1.5 h in headwind. As can be seen, HAK is a true light packer. Everything needed in a 15-20 l rucksack. Impressive! You have to be willing to live on energy bars and gels and leave any extra clothes such as rain gear home to do this, however. ... and then worse. Where did the trail go? Eventually we arrived at the Vajosuo trail and enjoyed a nice sunset. At this time of the year the sun sets at 21:30, so there is no shortage of light. The boardwalk is in pretty bad shape and occasionally challenging to ride. We continued towards Kangenmiekka, riding through dark forests and easier roads, trying to get to our destination while there was still some light. Getting more water at Käärmelähde (Snake spring). I wonder where that name comes from. The water did taste great. At 22:20 we arrived at the Halkokannisto shelter. It was already almost too dark to ride. If I would have gone alone I would have slept in a tent/tarp in a nice place fairly close to this shelter, but I think having the possibility to make a fire is nice when having company. (The everyman's right does not allow making a fire in Finland). When we arrived the forest was full of the sounds of birds singing. We could identify the ordinary species. A short while later all the birds stopped singing, all at the same time, which I found rather interesting. One bird, the nightjar (fi kehrääjä, sv nattskärra), did sing through the night. It has a peculiar sound. At 23:30 we went to sleep. Maybe two hours later I woke up to shots fired a few kilometers away. Some local idiot seemingly thought it was a good idea to go out shooting in the night and I heard about 30 rounds fired. I guess these things happen, since Finland unfortunately has the third most guns per capita in the world, right after USA and Yemen. ... as well as coffee and this time even a sandwhich. I felt sorry for HAK and made coffee for him as well, since coffee in the morning represent quality of life. Ready to go again a little before eight in the morning. Refilling the supply of snake water. We rode through Myllyoja, bypassed the Rehtsuo trails disaster without problems and arrived at the nice part of the Rehtsuo trail. Traditional bike posing place at Rehtsuo. After the Rehtsuo leg I had to ride directly home on roads to get home in time for lunch, about one hour at a good speed. HAK continued towards Turku along trails. The totals for this outing was 93 km and 6.5 h of actual riding / bike pushing time. Timewise most of it was spent on trails. A slideshow with more pictures is here. Thanks to HAK for the company! If and when I get my new project ready I definitely have to do a few overnighters again. It was really great this year to switch from snow hiking to the summer mode in less than one month! AFAIK normally the wet period lasts much longer. Konstantin, I agree. From my point of view this was optimal. A long winter, but when the spring came it come very quickly. I think the open fire rule applies regardless of who owns the land, i.e also state land. National parks / outdoor areas can have their own rules, but otherwise the only places where fire is allowed are shelters and other official places. It gets interesting when it comes to the wood (gas) burners such as the Bushbuddy and similar stoves. According to the strictest interpretation they might not be allowed. The backpack of HAK looks awfully similar (even same color) to my Deuter Race X that I have used for ten years, mainly for commuting. And the volume is only 12 litres, so it's really impressive. nice! is getting greener out there! After reading your blog, I feel that I really really really would need a bike... Great post once again! BTW At least for now wood stoves do not count as open fires so they are allowed. (This might change if they become very popular and/or cause fires...) But I am not sure what caliber and amount of fuel you are allowed to gather. But then again, no one cares about a few handfuls of twigs gather along the way. And the open fire rules apply also on state owned land but for example in the wilderness areas of the Lapland small fires might be allowed. But it depends on the rules applied to the area. In general, you need a permission to make a fire or you have to use an official fire place. Toni, you might be right about the backpack. That is true lightpacking. 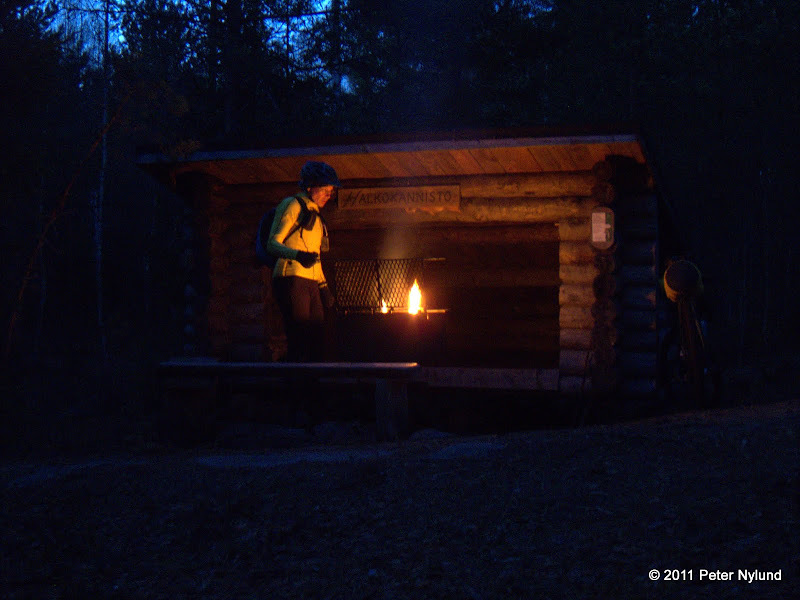 Jaakko, I think a bike is an excellent means of experiencing the national parks and outdoor areas in Southern Finland. The dreaded forest road sections that are so boring when walking are quickly traversed when riding a bike. Great stuff. Very interesting bike. I'm assuming a good old Cr-Mo frame? I do appreciate steel bikes! Thanks, Dave. The bike is a good steel frame, but it's not old. I bought it in December 2009. The Salsa Fargo is made exactly for the purpose I'm using it for. My Deuter Race X is 10 or 12 ltr, i am not sure, it is so old. The mat is Thermarest Profile Reg. It was packed with own bag in Deuter. The sleeping bag is Marmot Atom Reg Goose 0,6kg. It was packed directly in Deuter. There was still some space for energybars and one extra Craft undershirt and some other small items.